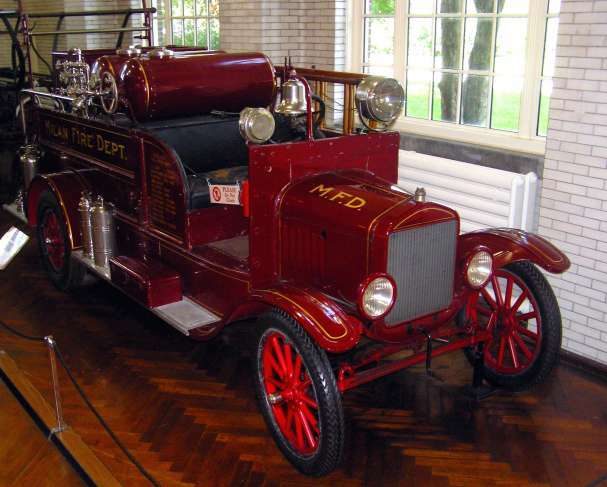 When Henry Ford was acquiring vehicles for his new musuem at Greenfield Village in Dearborn, Michigan, he attempted to purchase the 1926 Ford Model T fire truck owned by the Village of Milan. He had seen it during his visits to his coil factory in Milan. The truck was still in excellent condition. When he couldn't reach an agreeable purchase price with the Village Council, he offered a trade. He would swap a new 1938 Ford fire truck for the 1926 Model T.
The model T. is pictured above, where it can be seen at Greenfield Village. The Village of Milan agreed to the trade. The village received a new truck, equipped with an 85 horsepower flathead V-8 engine and five large soda-acid tanks for quelling fires. The trade took place in May 1938. The soda-acid tanks didn't work out too well so they were discarded in favor of a 500 gallon water tank and 250 feet of rubber hose, wound on an overhead reel. 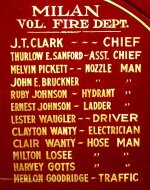 After many years of faithful service to the fire department, the soda-acid truck was retired to the Milan D.P.W. where it was used to "lay the dust" on dirt streets via an application of oil. In 1972, the Milan City Council donated the decrepit soda-acid truck to the Milan Area Historical Society. It has since undergone a ground-up restoration and is a sight to behold. It is used in parades and special events.